Kevin Jackson has been making unique miniature Tudor dollhouses for over 2 years. What started out as a hobby has turned into a full-time occupation since he recently retired from building real houses at exhibitions; something he had done for 20 years. No two houses are ever the same, as Kevin doesn’t follow any plans and the design of each house evolves as he works. 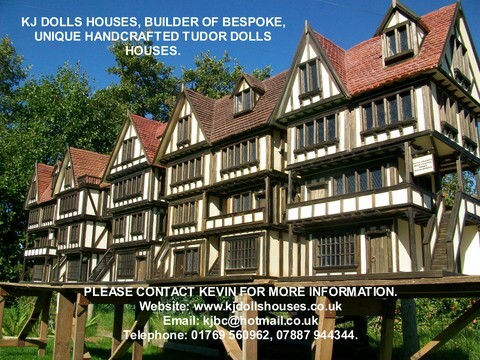 Each 12th scale house takes approximately 4-5 weeks to complete and costs anything from £750.00 to £3000.00 plus. 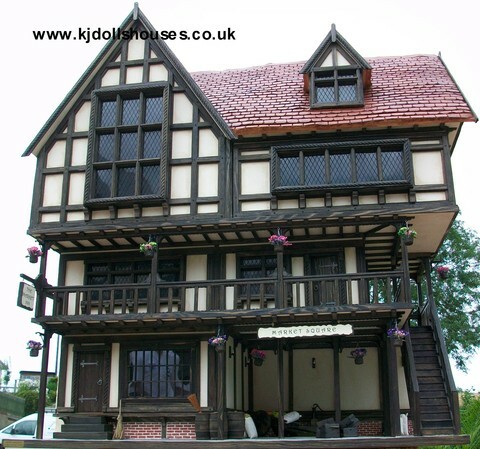 To see some of the houses he has made visit www.kjdollshouses.co.uk. The attention to detail and use of good quality materials makes these collector’s houses much sought after. All the wood for the beams, posts, floor boards, bargeboards and brackets is solid timber as the grain of real wood gives a more realistic, yet miniature, finish. The wood is then wire brushed to bring the grain of the timber out, the edges are then carefully distressed to give an aged appearance, before receiving at least 3 coats of stain. The leaded windows are handmade with a special finish on the ‘glass effect’ which gives it a textured relief when touched from the outside, just as Tudor glass would have looked. The windows come complete with internal ironmongery which is also handmade. 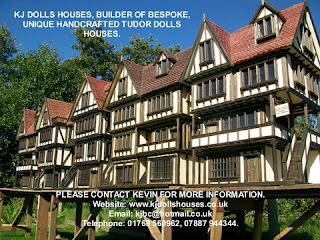 To duplicate how Tudor timber frame houses were originally jointed together, the outside of the houses feature individually cut, drilled and fixed timber pegs, in the positions where the structural joints would occur. On average this results in 100-130 separate pegs being fitted to every house. The internal floor boards are all handmade and then laid one at a time. To add a realistic touch, each one has joints carefully cut into them, complete with nail holes on both sides of the joint. All the ‘heavy oak effect’ doors are handmade and have a full set of handmade authentic looking dummy hinges and twisted metal pull ring handles. All houses come fully lit with handmade lights. The roofs, paving and chimneys are plastered and sculpted by hand, all of which are then painted and treated with matt varnish to protect the finish. Kevin is always happy to discuss customer’s specific requirements before taking the order, to ensure that they are getting the house of their dreams. IMPRESIONANTE!! es increíble, completamente perfecta.